The M.S. 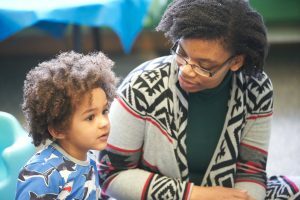 program in Early Childhood Special Education prepares graduates to work with diverse infants, young children, and their families in a variety of home, school, community, and agency settings. This program in the Department of Teaching and Leadership is for students who have an interest in early childhood general and special education. Students will explore the intersection of K-2 classroom knowledge with the social and emotional needs of all children. There is a strong emphasis on collaborating and interacting with families during the discovery, diagnosis, and IFSP process. This program meets the academic requirements for for initial and professional New York State teacher certification in both Early Childhood Education (birth-grade 2) and Students with Disabilities (birth-grade 2) – one of the only dual certification programs in the area. 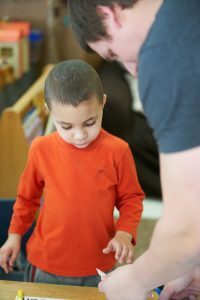 Why Early Childhood Special Education at Syracuse? Most students are employed at or immediately after completing the program. Look beyond the classroom to the developmental domains – social and emotional needs, mental health care, family issues, and socioeconomic factors. Work with faculty members who are leaders in the field of child and family studies, early childhood, special and elementary education, literacy, neonatology, physical therapy, and occupational therapy. Builds on the long transition of inclusive education and disability studies in the Syracuse University School of Education. Prepares students for teaching diverse students in 21st century classrooms. From experiences in university classrooms, online, and in schools and communities, you will learn to design inclusive, culturally relevant pedagogy for all students. At least 4 field placements in early education, prekindergarten, and K-2 settings, including full time student teaching placements. These placements are at a variety of settings with partners that share close relationships with the School of Education, like the nationally-recognized Jowonio School that also provides paid TA and assistant opportunities for students. Interested students with existing initial certification in Students with Disabilities (birth-grade 2) should consider our M.S in Inclusive Special Education (Severe/Multiple Disabilities).